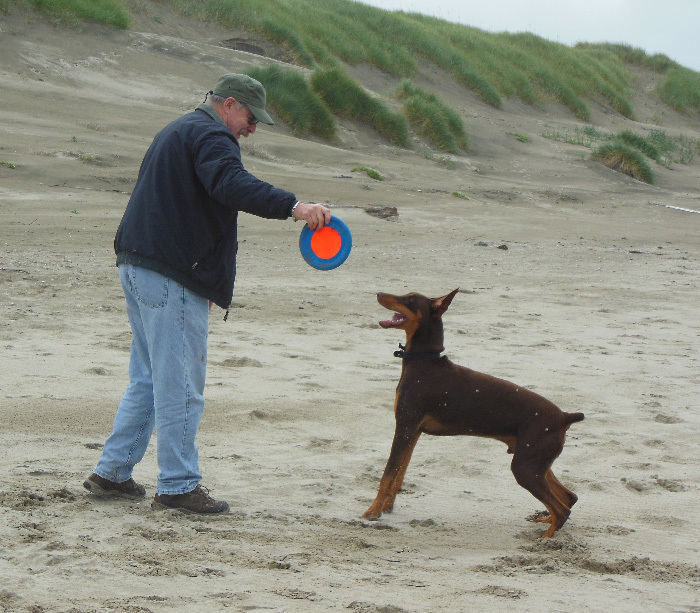 As a sort of pre-Memorial Day Weekend trip, Jere and I, accompanied by dogs Duke and Xena, went on a short jaunt north and then back down the coast. It was a trial run with the dogs in the RV, to see if they (and we) would be able to do it. We knew we were going to take Duke, but taking Xena was a hard decision. She was so old and we knew her time was near. We’ve left her with friends or a house-sitter in the past, but she was so sad when we got home. Last time (our first trip with the RV) she immediately went out to the RV and got in it, determined not to be left behind. So, this trip we decided to take her. It started out okay – she was her normal travel self. Drooling (like most mastiffs are wont to do), and panting like she typically does when in the car. We stopped in Eugene to pick up a few things for the RV and Jere walked the dogs. On that walk, Xena had a heart attack, and died within minutes. I was able to be with her at the end (as her primary person, it seemed important). The whole incident was over and done within 10 minutes. I sat in the driveway of the now-closed store we were at, petting her and crying while Jere, bless his heart, got a box and someone to help move her body. As I was worrying about what to do, he’s the one that realized out next stop was already planned to be PetSmart, where we could probably find out what next. Obviously, we couldn’t take her remains with us for the weekend. The people at PetSmart were very nice and understanding. They have a service for a communal cremation, so we made arrangements. I would have preferred to bury her here on the Ranch with the other dogs we’ve had and loved, but she’s in my memory, which is the important thing. We’ve been researching different types of places to stay. Some RV Parks have pretty strict guidelines. Some only allow “newer” vehicles, I guess to keep out the riff-raff. And then there’s the matter of limitations for pets in general, especially “large” dogs of a “dangerous” breeds. So, since we have a “vintage” RV, and a “dangerous” doberman, options are a little bit limited. One type of place that takes anyone and pets (leashed and well-behaved), is county fairgrounds. Many of them have RV parks with hookups, and are quite nice. Our first night out we stayed at the Benton County Fairgrounds RV Park, in Corvallis, Oregon. It was crowded, something like living in a city apartment complex, but quiet and there were large spaces to walk Duke, who seemed a bit down. One of our missions on our mini-trips is to make sure that we can get and stay connected to the internet, and have a set-up that will allow us actually work while we’re on the road. This trip we tried out a desk arrangement, which worked okay, but not great. We were able to get connected — but after the long and emotionally draining day, not much was accomplished. In the morning we did manage to get a little work done between walking the dog and keeping him entertained and figuring out how to get coffee and breakfast prepared. Late morning we unhooked, stowed all our stuff, and headed down the road to my appointment in McMinnville. After my appointment in McMinnville, we headed over to the coast at Lincoln City and drove down 101 to Newport. Jere drove and I got to watch the scenery. Beautiful! Once in Newport we found a nice place for dinner (I didn’t feel like cooking) and then headed to the South Beach State Park where we had reservations for the night. The nicest part of this campground was the fact that it was a short (1/4 mile) walk to the beach on a very well maintained path. Except for the mosquitoes, it was very pleasant. Duke had to be on a leash the ENTIRE time in the park, but once on the beach the leash laws are loosened and dogs can run free. He had a GREAT time chasing his ball and frisbee and just plain running around (and around and around and around). After our walk, we settled in to do a little work and then hit the sack. I slept surprisingly well! In the morning we took another walk to the beach, and then packed up to go. After unhooking, I drove the RV on the first segment of the trip – south down 101. We made it home unscathed, tired, sad from our loss, but all-in-all pleased with how things went. We’re gradually getting a feel for how this is all going to work, and are more and more confident that we’ve made the right decision to go on the road in the fall. But, on our trip we discovered a few more things that need to be worked out with the bus … a leak in the bathroom over the shower, the need for more ways to secure items (like the roses that fell over and the coffee maker that landed on the floor), and ways to secure cups, maps, iPads and sunglasses around the driver and passenger area. Oh, and we discovered that even unopened milk containers can leak when they are on their side in the ‘fridge. I am very sorry for your loss. It’s hard to lose someone in the family. It’s good that you were with her at the end. She was a beautiful lady. 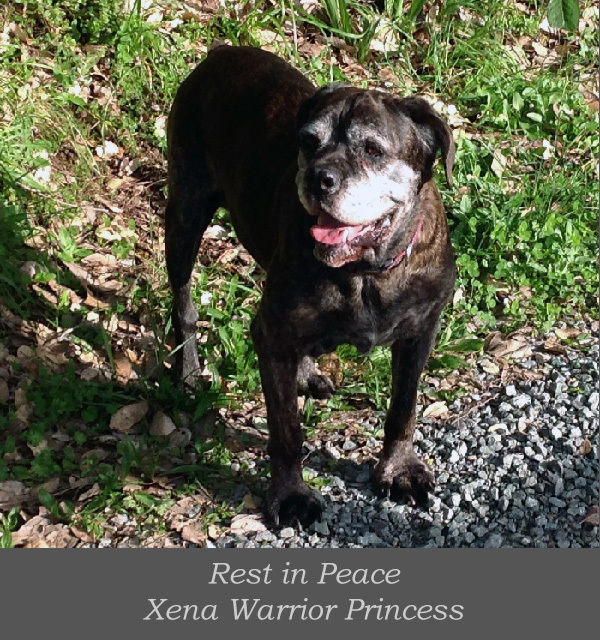 Sorry to hear of Xena’s demise….